The quinoa, chicken, and veggies are all cooked in ONE dish – the crockpot makes this dinner incredibly simple to make! This is seriously one of the easiest teriyaki chicken recipes ever. On this site, there does happen to be a very simple oven baked teriyaki dish which my family seriously loves, but as far as getting some veggies, grains, and fruit all cooked and ready in one dish? Well, this is the winner. The chicken, quinoa, peppers, and pineapple are all cooked together in the crockpot so you don’t have to waste extra pans cooking up things separately. And the result is a flavorful, healthy, and delicious dish with incredibly little prep time! The nice thing too is you can change up the veggies a bit to your liking. I love bell peppers and onions in any kind of teriyaki dish, but other great options for veggies: chopped zucchini, cauliflower, snap peas, a can of corn, diced carrots, etc. The vegetables you choose don’t necessarily have to go with a traditional chicken teriyaki so do whatever you enjoy! Add pretty much as many different veggies as you want, but stay close to having about 2-3 cups total of raw veggies going into the crockpot. For the fruit, the pineapple is a must! (Unless you really hate it or have an allergy.) The can of pineapple adds so much good flavor and is a nice texture addition to this dish! The important thing to note with doing any kind of dishes in the crockpot is that crockpots cook differently. Make sure you know your crockpot and are able to watch this recipe accordingly. Some crockpots cook a lot quicker and some a lot slower than others. I use a 6-quart crockpot and on high, this dish took almost exactly 3 hours to be done. At the three hour mark for my crockpot, the chicken is tender and shreds easily, the veggies are tender, and the quinoa is cooked through. I don’t suggest times to cook this dish on low in the crockpot because I haven’t always had the best of luck with quinoa and chicken dishes in my crockpot when done on low. That said, a lot of readers have commented on past quinoa crockpot recipes and had success with cooking on low. With chicken and quinoa, most people have the best luck from 4-6 hours on low while still watching it and checking on it frequently. However, if you are able to cook it on high, I definitely recommend doing that. When you do go to check on this dish it may seem a bit watery. That’s just how it’s supposed to be! By the time the quinoa is completely cooked, a lot of the liquid will be absorbed. And after you shred the chicken, it absorbs even more of the liquid. The last step to this dish is adding a little bit of a cornstarch slurry to thicken up the small amount of remaining liquid. And voila, you’ve got one heck of a dish with very little work!! Add in the quinoa (rinse first to remove the bitter tasting saponin coating) and beef or chicken broth. In a small bowl, whisk together the honey, white sugar, soy sauce, rice vinegar, ground ginger, minced garlic, and pepper until well combined. Chop the peppers and stir in. If desired, add in a chopped onion or half of an onion in here now too. See the second paragraph of the post for other ideas on vegetable additions. Put on high for 2 and 1/2 - 3 and 1/2 hours depending on your slow cooker. Mine took exactly 3 hours, but watch carefully because all slow cookers will cook differently. Shred the chicken (it will absorb a great deal of the liquid) and pour in the drained pineapple chunks. In a small bowl, whisk together the cornstarch and water until smooth. Pour in the crockpot and give everything a good stir. This is optional just for thickness. Serve with sesame seeds and a chopped green onion if desired. I love this! Teriyaki plus pineapple sounds like a winning combination to me. You make the best quinoa dishes, Chelsea! This one looks absolutely amazing. And I’m loving how quick this is to throw together! Pinned! Such a good combination- Another winning quinoa recipe Chelsea! 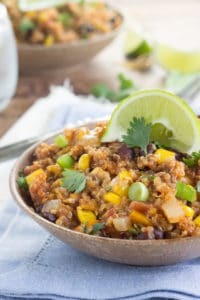 LOVE family friendly slow cooker recipes like this that are SO easy for the whole fam, such an easy weeknight solution! Eeeeek! Chicken teriyaki is probably one of my favorite foods EVER and now I have access to one that can be made in the crock pot + features healthy additions. SCORE! Can’t way to try this :). Pinned! Love these, your dishes are always so colorful and pretty. I have never made quinoa in the slow cooker, but there is always a first. Also, I would like to add cauliflower as you suggested, but do you think it will get mushy? If you are worried about it getting mushy, I think if you added it about 20-30 minutes before serving time, it should be fine 🙂 Hopefully that helps! I have never made quinoa in the slow cooker, but there is always a first. Also, I would like to add cauliflower as you suggested, but do you think it will get mushy?This one looks absolutely amazing. And I’m loving how quick this is to throw together! I LOVE doing quinoa in the slow cooker 🙂 If you are worried about it getting mushy, I think if you added it about 20-30 minutes before serving time, it should be great. Or you can steam/roast it beforehand and then add it to the finalized dish. Thanks for your comment Sneha! This looks incredible, Chelsea! Love that you used quinoa and how easy it is to put together. 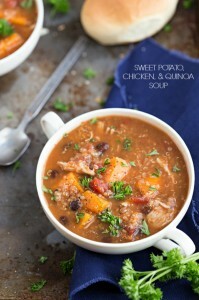 Making this in the slow cooker makes this the perfect easy meal! This chicken looks amazing Chelsea! I love teriyaki everything! Totally adding this to our meals this week! 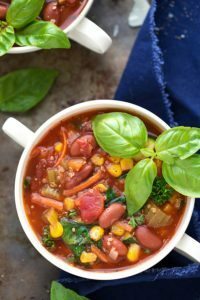 I adore crockpot meals, they are just so easy! The teriyaki sauce sounds amazing, I love the sound of this dish (and how healthy it seems). Pineapple is pretty much one of my favorite fruits ever, so I will definitely be using that, too! You know, I haven’t taken out my crockpot once since the weather got warmer … which is just plain silly. This chicken dish looks awesome! Have a great weekend!! You are so right! The pineapple is a must for sure! This looks just great! You gave it 5 stars… how was it? I don’t see any reviews. I wish slow cookers were consistent across the board, it would make food bloggers jobs so much easier 😉 This looks delicious, and I love that you have a complete, healthy meal all cooked all together! Pinning this. It’s a crock pot winner to me. Beautiful pictures as always. This is such a perfect dinner idea! So easy and healthy. All about this! Oooo yum. I like the idea of changing the vegetables to what I fancy too. Looks delicious! Do you have any suggestions for what to use instead of rice vinegar? I don’t have any on hand!! This looks amazing!! Do you have the nutritional facts? Thanks! This looked and sounded amazing and I was excited to give it a whirl. It was soooo good (even though I shredded instead of chunking the chicken) until I added the cornstarch/water mix to thicken it a bit. BAD IDEA. All I can taste now is cornstarch. I’m working on fixing it now. I will definitely make this again…. WithOUT the cornstarch as the thickener. Oh I shred the chicken for this too most of the time 🙂 I am so glad you loved the flavor before the cornstarch, sorry you didn’t enjoy that cornstarch addition, but definitely make it again and just leave it out 🙂 Thanks for the feedback Amy!! You say to add the pinapple after you shred the chicken can I add it before while everything else is cooking ? I personally wouldn’t, but I don’t really love cooked pineapple so that’s up to you. I’m allergic to quinoa, has anyone tried making this with brown rice or cous cous? Does it cook different? Do I need to cook the rice separate? Any thoughts would be helpful! Chelsea can you prep it all in a freezer bag and then dump bag into crock day of use..
Sure! I don’t see why not 🙂 I haven’t tried it so I can’t say for absolute sure. But I think it will work great! The flavor of this was really good and it was definitely easy! The only change I would make next time would be to add the veggies in later (maybe the last 1/2 hour to hour) – I used zucchini, bell peppers and onion and they had pretty much disintegrated by the end. Thanks for the recipe! Will definitely make again. Haha sometimes it does that, so weird! Thank you so much Kristen! Has anybody, but one lovely lady, made this? It sounds amazing, but worried about the startch taste. If you are worried about the cornstarch just add a little it to a very small isolated bowl and give it a taste! 🙂 If you prefer it without it don’t add it to the rest. I liked the flavor of this but not the texture. Was too mushy for my liking. Not sure if I over cooked the quinoa or not. But next time i will definitely add the veggies toward the end. I used zucchini,bell peppers and onion as well that had pretty much meshed in with the liquid. My snap peas were perfect though. I’m glad you liked the flavor! If it was mushy, it was probably overcooked a bit. Next time maybe check it an hour or so sooner? And yes, veggies can definitely go in near the end! Thanks for the comment! Mine was super watery.. even with the cornstarch. I was so bummed! It had good flavor though, just didn’t turn out like your pretty picture. Any tips for if I try it again? Hmm it shouldn’t be watery 🙁 I’m glad you enjoyed the flavor though! It may be using thighs — did you use the same weight as the breasts? If not that could be why. Another thing, was the quinoa fully “popped”? If the quinoa wasn’t totally done cooking it wouldn’t have absorbed all that extra water. If it was though and you want to try this again maybe reduce the liquid slightly and just keep an eye on it. Wish I could be of more help. Unfortunately sometimes it can also just be the difference of slow cookers. I love this recipe so much!! Do you happen to have the macros/nutritional info on it? Ok this looks delicious! I was was going to try and make this as clean as possible, so I wanted to know if you recommend a sub for the sugar? Would Truvia tastes similar? I just don’t want to butcher recipe. I know a good sub for soy would be coconut aminos but am stuck on weather to sub sugar or just leave out. I want to try this using a whole chicken. The only thing I’m worried about is the quinoa getting overdone. How long would you say is too long for quinoa to cook on low? I never recommend cooking quinoa on low because it gets super mushy. I would probably just cook the quinoa separately if you are planning on using a whole chicken. Good luck! Have you ever done this with chicken thighs? Want to try it, but that’s all Inhave on hand. Looks delicious!